Anyone sooner or later faces the need for some repair work in the house. However, while a full major repair work often requires professional assistance, the windows and doors can be repaired on your own, without professional specialist services. As a result of improper and long-term operation, doors and windows start coming apart, swinging open, squeaking and falling to pieces. They may also get warped or even sag. These are simple defects, which can be easily fixed with glue, joinery tools and screws. Let us consider a few situations. If a door or a window got jammed, first of all you have to give it an angular inclination matching the frame. This is not hard to do. You just have to insert a wooden or a cardboard shim underneath the hinge. It’s worth reminding that if a window, for instance, is jammed in its upper vertical location, the shim should be placed under the lower hinge. 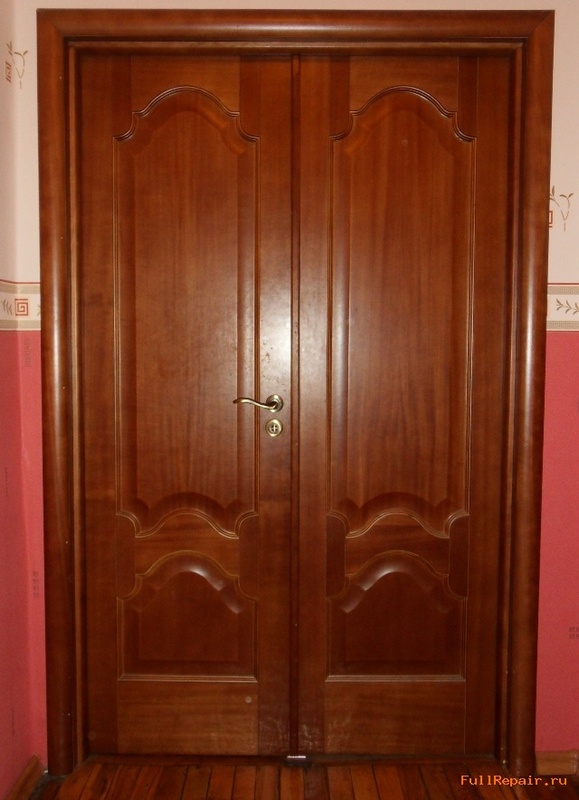 A door usually gets jammed as a result of obtaining a large gap with its casing in the hinge area. In this case, it would be enough to slightly «sink» the hinge sockets deeper. The door can sometimes spring, even if the hinges are deeply incised, and the screws are well recessed. This is increasingly the result of tight junction door to the box. In this case you should always cut a little bit on both or one side with a large chisel width. As for the windows and doors had settled here by the lower and upper halves of the loops enclose a self-made spacers in the form of wire rings or washers, pre-lubricated with oil. If this method did not bring the desired result, the loop just rearranged a little higher. Sometimes the door might start springing even if the hinges are deeply fit and the screws are deepened well. This results from a close juncture between the door and casing of the door. In a case like this you need to slightly cut off from one or both sides using a wide chisel. To fix sagged windows or doors, you may use the shims hand made of a snap ring or the oiled washers. If this method does not bring about the desired result, then the hinges should be displaced slightly upwards. Sometimes the door or window does not close tightly enough in case the fabric, wool or leather pads are used at the joint. This can be repaired quite easily by nailing or gluing a thin wooden lath (rubbed down and dyed beforehand) to the flat end of the door or window. Don’t forget to sink the nails well, when doing this. If the door dried out causing cracks of up to 2 mm wide (1/12") to appear on its surface, it is time to fill them with some oil-containing putty. Before doing that, clean the wood from dirt and dust, and coat the door with a linseed drying oil. If the cracks are over 2 mm thick (1/12"), they should be filled with strips of dry wood. In case of a fixed door panel, it must first be dismounted from all sides of the door. Only after that the above listed manipulations shall be performed, followed by setting the door panel back in place. Every so often a wooden door leaf may need to be shortened. This can be done by a standard handsaw or a portable electric circular saw with small teeth. To make a saw cut straight, the door should be secured with a wood board from the opposite side. In order to easily follow these operations when needed, a lower part of the door leaf is purposely manufactured from solid square log or light massive wood. However this area might appear to be not big enough. Then the door leaf should be cut to the required size, while the cavity resulting from this operation can be covered with a wooden block and fixed with glue. 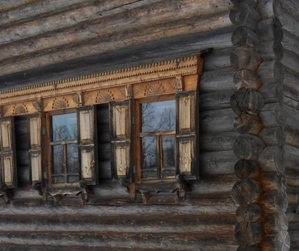 Windows and front doors are usually more often exposed to deformations in particular seasons. The wood may periodically swell or dry out. If that happens, the top layer of swollen wood has to be removed in order to ensure free door closing without excessive force. After it dries, apply a special shim with adjustable width. To make such a shim you will need a rectangular plate of tin about 5 cm wide (2"), e.g. from a tin can, or a piece of brass or copper. The length of such piece should be twice the thickness of the door. This shim needs to be mounted with nails or screws to the top flat end of the door leaf and folded in half on top of its front corner. Then an elastic but quite tight filler piece should be inserted and squeezed in between these metal plates. That makes it possible to adjust the shim width easily, whenever needed in the future. The live example is a door that swells in the summer and wouldn’t close. After making the hinge sockets deeper, it started closing perfectly again in any season of the year. All recommendations described above will help to solve typical problems relating to wear out of windows and doors on your own. The same applies if you have faced a much more complicated situation that does not match any of the above listed cases. It is worth reminding that if you are unsure of your own capabilities, you should rather consider specialist assistance. Professionals would quickly fix the problems for some charge and then you may start using and enjoying the result of their qualitative work.